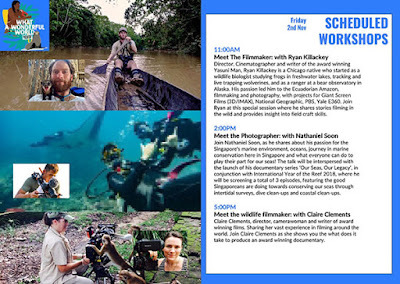 Come for the Singapore Eco Film Festival! Nathaniel Soon will share about Singapore shores and people who care about them. Films about Pulau Ubin and the efforts to restore mangroves there, as well as other marine issues will be screened. And International Year of the Reef 2018 will be highlighted too. 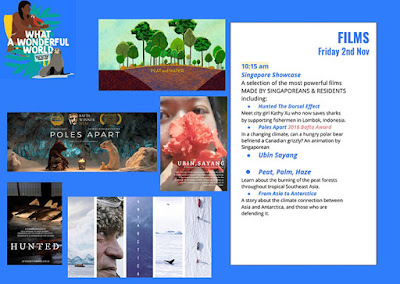 Check out the Singapore Eco Film Festival website for free tickets and more details. 'Ubin, Sayang' is a gorgeous film by Rachel Quek and her team about the people of Ubin and the Restore Ubin Mangroves (R.U.M.) Initiative. 'Ubin, Sayang' traces the journey of Xiao Ting as she learns from the stories of mangrove restoration and kampong living. In the context of modern Singaporean nostalgia for the kampong, the film brings together different perspectives on what the kampong spirit truly entails, and discusses its implications for us today. Join Nathaniel Soon as he shares about his passion for Singapore's marine environment, oceans, journey in marine conservation here in Singapore and what everyone can do to play their part for our seas! 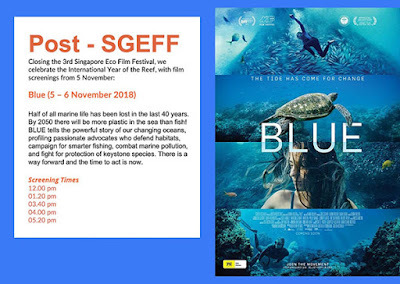 The talk will be interspersed with the launch of his documentary series 'Our Seas, Our Legacy', in conjunction with International Year of the Reef 2018, where he will be screening a total of 3 episodes, featuring the good Singaporeans are doing towards conserving our seas through intertidal surveys, dive clean-ups and coastal clean-ups.